Today we are launching the brand new Young at Heart Collection! Inspired by a truck that the Bontrager family (Heartfelt Creations) has in their garden, I wanted my truck to be a planter. Hope you enjoy a glimpse into the garden of my dreams. "Hit the open road with the new Young at Heart Collection by Heartfelt Creations! 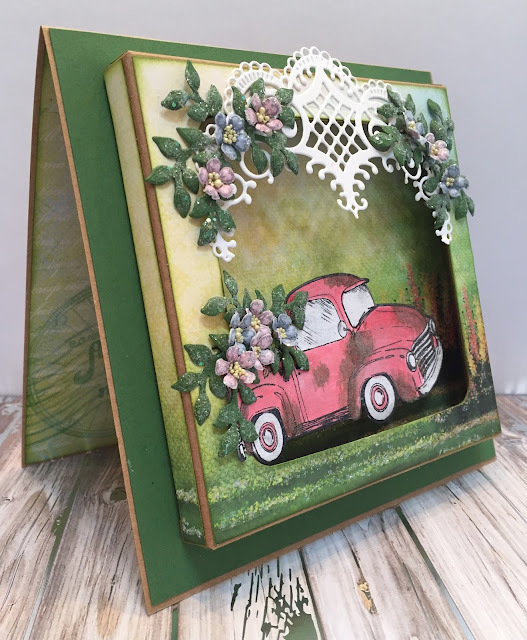 Retro in style, this fun and playful transportation themed assembling of designer papers, cling stamp sets and coordinating dies will have you reminiscing and reliving past road trips with family, taking in a flick at the local drive in, sitting at the late night hamburger joint with friends in your classic automobile, or soaring the open skies in a vintage airplane! The classic style paper collection is filled with far out transportation graphics from an era in time where life was carefree and the journey was wherever the open road would take you! Diamond checkered patterns, retro themed signs, beach scenes and late night diner script mixed with vintage vehicle graphics are enveloped in a groovy color palette of bright stoplight reds, yellows, and greens, with a hint of electric pinks, flashy teals and glowing orange tones. Two sets of nifty cling stamp sets with coordinating dies reveal high wheeled bicycles, old fashioned airplanes, classic coupes, vintage pick-up trucks as well as several nostalgic banners and signs! A third fun filled cling stamp set flaunts hip and amusing sentiments sporting 50’s era style script perfect for completing the styling of days gone by on all of your retro themed creations! So grab your main squeeze, make sure you’re the first one to call shotgun and travel along with us as we cruise back in time where we will always be forever young! Warning: use of this collection may cause feelings of youthfulness, feeling carefree or a desire for adventure!" Instructions: Cut a 6” x 6” Kraft tent fold card base and a green mat 5 7/8” x 5 7/8”. Adhere the mat to the card base. Cut one piece of paper from the paper pad for the inside of the card, ink the edges and adhere. Cut paper from the paper pad to cover the shadow box. You will need two pieces 4 7/8” x 4 7/8” - one for the inside and one for the out side, and four strips 4 7/8” x 3/8” for the sides. Cut the square from the front piece using the Cut Mat Create 2A die and ink all of the edges with Olive Grove Ink. Cut the decorative die from the Festive Holiday Die set. Stamp the truck on white cardstock using StazOn Jet Black Ink and and color with 3D Stamp Paints using paint brushes. Use the Walnut brown 3D Stamp Paint to make the truck look like it’s weathered/rusty from sitting in the garden for a long time. Stamp the Wildwood Cottage flowers on paper from that collection with London Fog Ink, cut out with the coordinating die and shape using the Deluxe Flower Shaping Kit. Add Rajni Chawla’s Crystal Clear to the flowers, add prills to the centers. Stamp the leaves from the Simply Classic Cling Stamp Set on green cardstock with Olive Grove ink, cut out with the coordinating die, shape, spray with Sparkle Sheer Shimmer Spritz and add glitter. Cover the shadow box with the designer paper and adhere to the card base. Adhere the flowers and leaves to the truck and adhere the truck to the inside of the shadow box using Double Dots. Adhere the decorative die to the front of the shadow box as shown and add flowers and leaves. Add Lion’s Mane and Transparent Glitter to the designer paper. Thank you for visiting my dream garden! to see what all of the super talented Designers have created! I love this one. Beautiful!!! Thank you Laura! Rylee was here at the house when I was working on this one and I was a little insecure about the "dirty" truck so I had painted a different one. Rylee said "oh no Grandma, you have to use the dirty one, it has so much more character." lol I guess when your 7 year old granddaughter says that, you go with the dirty one! 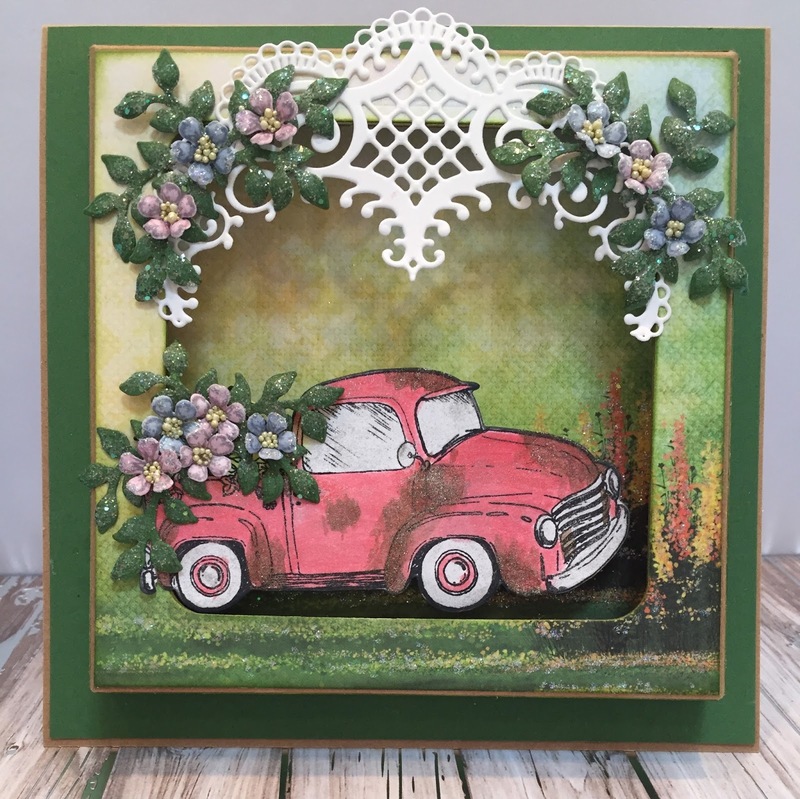 This is gorgeous - I love how you have put the rust on the truck and your flowers are gorgeous! I love the rough, tough truck in your shadow box Janet! Looks like a favorite truck of grandad or a young guy who likes to drive his truck through the mud!!! Either way, it's amazing! Super cute card! Love the dirty, rusty truck look you've created, Janet! Beautiful filled with the flowers!